Travel the “road to the sky” which offers views of the towering 14,000-foot San Juan Mountains to rolling hillsides speckled with ancient Indian pueblo ruins. Victorian towns offer both excitement and relaxation. 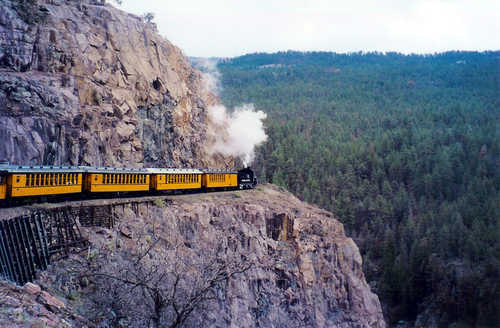 Soak in hot springs, ride the narrow-gauge railroad, and sleep under the stars or in a cozy lodge. Durango, is a well-preserved descendant of the Old West. Picturesque Telluride is renowned for world-class skiing, and film, jazz, and bluegrass festivals. Silverton and Ouray are Victorian jewels tucked in deep alpine valleys. Add another crown – Mesa Verde National Park, home to one of the densest collections of prehistoric ruins in the U.S.